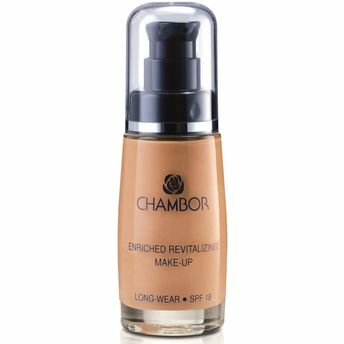 Chambor Enriched Revitalizing Makeup is a long wearing foundation with SPF 18. This light weight and blendable foundation enriched with ginkgo biloba extract helps restore skin's firmness and also help fight against free radicals. The moisture rich creamy formula is enriched with hop extract that helps restore skin's firmness while minimizing the visible signs of ageing. It will give your skin a radiant look thats stays put all day long. Explore the entire range of Foundation available on Nykaa. Shop more Chambor products here.You can browse through the complete world of Chambor Foundation .Alternatively, you can also find many more products from the Chambor Enriched Revitalizing Make Up Foundation range.